Any time you move you will likely face the challenge of finding a suitable home for your horse. If you like to ride often you will have to choose a stable that is both accessible and close. Depending on your needs you will either need to find an arena for schooling or a place with an array of trails or perhaps both. If you prefer cross country then you will need a large area for trails. While that can be a lot of fun activity at a big bar it can also become frustrating since you won’t get much quiet time with your own horse. Depending on your schedule you may not be able to work with a stable that has set hours. can also choose a boarding stable where they will be pampered. If you prefer to have your horse out at pasture you will likely want to select a boarding facility with a large and safe pasture that has some form of protection against the elements. Everyone and their horses are different and will want different things from their boarding stable. 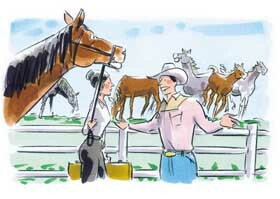 It is important to look around and learn about what you have to expect when choosing a stable. Before considering which one to select you should make a list of priorities. Finding the perfect boarding stable for a horse is similar to finding the perfect home for yourself. You want to get the best care for your budget, but you would also like convenience and a place that you are happy to be stuck with. After you have found your top five facilities try to find a place for your horses at these areas. When it comes to making your decision you should always remember that there is no perfect boarding facility. You will need to choose which features you can’t do without and which features you can get rid of to make room for others. The first on your list is usually going to be your horse’s health and safety. If you horse has a herd mentality because they are normally turned out with twenty other horses then they will likely do okay when put in with a new herd of around twenty horses. However, if you horse is only used to be being in a corral with two other horses then there are going to be problems if you place him in a herd with twenty or so other horses. Horses know how to be submissive to the lead horses only if they are accustomed to a herd environment. Horses who haven’t been in the situation before likely won’t know what to do. It is important for a boarding stable to have a neat appearance. There should be good, safe fences and a well-kept appearance. You should take a walk around the stables pastures and see what the facility looks like. Make sure there are good board fences and not sagging fences or barbed wire. Consider the condition of the stalls, there should be not nails sticking out or boards missing. You should also take a look at the water buckets. If the buckets are dirty when you first see them then they are likely to only get worse. A barn should be well ventilated and have a lot of light. Also consider the bedding. Is there enough of the bedding and it is the type that you would normally choose for your horse. One of the most important questions to ask is if the stalls are cleaned regularly. Even simple matters can have an impact on your horse’s safety such as the location of cross-ties and the ceiling height of the barn. If you have a seventeen-hand gelding you shouldn’t have a barn with low ceilings. Talk to the owner about the health schedules. The whole barn should be on a similar deworming schedule otherwise it could be a waste of money. Find out which vaccinations are required to board the horse and if the horse needs to have a negative Coggins test since this should be a very important requirement for the stable. Consider the knowledge of the workers; it is important for everyone to know what they are doing including the stall mucker. The workers should be aware of when to call in a vet and when you horse doesn’t seem right. It is also a good idea to make sure you choice of farrier, veterinarian and trainer can use the facility you are considering. Problems can result if for some reason the owner doesn’t want your chosen farrier or trainer at their facility. Ask the stable if they can handle any special needs for your horse such as scheduled medicines or supplements. The horse may be in a good pasture boarding situation which doesn’t require the need for vitamin supplements twice a day. The feed and forage the stable offers is another important consideration. A maintenance ration may work for a pleasure horse, but you will need more if you have a performance horse. Find out what the owner will give to a horse on a specialty diet and how much extra it will cost you. When looking for the right stable for you horse you should also remember to consider yourself. The tack room situation and security should meet your requirements. How is your saddle stored and would you prefer a individual locker or in a room with the other saddles? Do you prefer a full restroom or are you okay with a portable toilet. You may want to consider finding a barn that has riders with interests similar to yours. You may not want to board at a place with cutting horses if you prefer show jump. A big-time show barn may not be the place, if you trail ride your horse. Always ask to read over the contract and if the stable doesn’t have one that is a big mark against them. Everyone should be well aware of the rules through the contract. The contract should allow for the stable owner to call for a vet if the horse in ill or injured when the owner cannot be reached. Once you find a stable that meets your priorities you should make some local calls and make sure the place is reputable. A good way to find out is by asking the local veterinarians since they will have a good rapport with the good facilities. Talking to other boarders is another way of finding out about the facility. Read the next horse care article on Cleaning Horse Stalls.